Sorry, the page you're attempting to access no longer exists. You may wish to try using Colt Models Quick Search above or the search page to see if you can find what you're looking for on the site. Our apologies for any inconvenience this may have caused. I am always looking for quality Colt Automatic Pistols, Revolvers and firearms related items so please check my WANTS list. 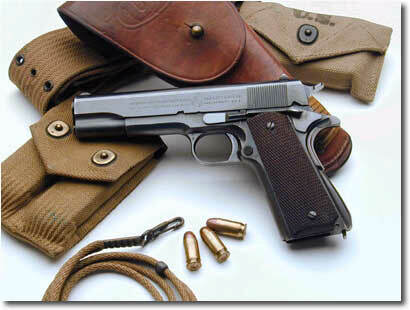 I am particularly in need of factory variations of engraved, inscribed and specially finished pistols (i.e. gold or silver plated). Additionally, I am looking for unusual grip types (ivory, pearl and deluxe walnut) as well as Colt Catalogs, advertising pamphlets, instruction sheets, original documentation, manufacturing gauges, presentation cases, etc. If you have a question about one of these models or if you have an item in which I might be interested, you can send an e-mail message to slisker@coltautos.com. Email typically gets the fastest response, but if you would prefer to contact me by phone, my number is 703.281.6628. 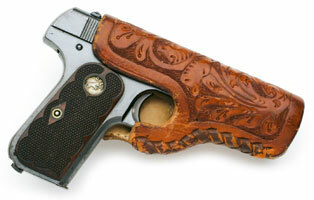 Gold inlaid and plated Colt firearms are among the most uncommon variations ever encountered. They were typically reserved for people of means and when the work was performed by the Colt factory, it often increased the purchase price of a standard firearm by a factor or four or more. Presented here are a few Colt pistols that are both factory and period aftermarket gold inlaid and gold plated. Click here for more info. Enjoy! From the early 1900s, Colt Automatic Pistols have also played a part in Texas history. Presented here are a few early Colt pistols that were shipped to Texas as well as one that was shipped to a guy names Tex! Click here for more info!